In tonight's Presidential debate it wasn't surprising that Romney, the Republican candidate, would drag that Solyndra story out of the woodwork again. What was surprising was for him to name a list of supposedly failed green technology loans by the Obama Administration, which for some reason included Tesla. It makes one wonder how he could expect to get away with such an outrageous claim because it is so obviously wrong. Solyndra was obviously a failed Dept of Energy loan, and has been made into an embarrassment for the Obama Administration. Additionally, Solyndra has become a tool for some pundits to tarnish other programs, for example to call something "another Solyndra". That company did crash and burn in a spectacular way. The loan program Romney named during the debate provided $16.1 billion in loan guarantees, and as of May had a default rate of about 1.7 percent, according to congressional testimony. After mentioning Solyndra, Romney went on to name a list of other companies in an obvious attempt to amplify the supposed failures of the Obama Administration green technology strategy. This list included Ener1, Fisker and Tesla Motors, all of which are in the automotive industry. Ener1 did go into bankruptcy in January, which might make one think it was a failure. In that case the bankruptcy was entirely understandable, because Ener1's investment in Think failed, and was done in cooperation with Ener1's investors, and Ener1 has since emerged from bankruptcy. Whether Ener1 is a failure is a matter of debate, but it did not go into outright collapse like Solyndra did. Fisker has been having a rough year, between quality problems, and that the Dept of Energy froze the loans to Fisker, which threw a spanner wrench into Fisker's manufacturing plans in Delaware. But in May the company issued a business update saying everything was fine, and they've been able to raise hundreds of millions of dollars in financing. To top it off, even though Fisker had repeated delays in bringing the Karma plug-in hybrid luxury sedan to market, they have delivered well over a thousand cars to paying customers. This is hardly a picture of failure. What about Tesla? Unlike the other companies just named, Tesla is firing on all cylinders. The Tesla Model S began deliveries last summer, pretty much on the mark of when expected. Along the way the company took control of a disused automobile factory for manufacturing the Model S and Tesla's future electric cars. This had the benefit that this factory, in America, remained in operation as a factory, keeping much-needed manufacturing jobs in the U.S. when so many companies are launching manufacturing operations in other countries. According to today's blog post by Elon Musk, the company has created over 3,500 well paying jobs. And, there is this collaboration between Tesla and Toyota on the second generation RAV4 EV, which features a Tesla designed drive train, and which launched almost exactly on target. The company is having so many successes one wonders just how anybody could possibly consider Tesla a failure? We see here that of the companies Romney named in tonight's debate, at least three of them cannot be considered a failure. One of them, Tesla Motors, is having so much success that it is the opposite of a failure. It has been decades since the last successful start-up automobile company, that's how hard it is to start an automaker. That Tesla is on the verge of becoming cash flow positive is nothing short of phenomenal. Apparently you are not paying attention. Although I think Tesla is a great company and would buy an S model if I could, Tesla would be out of business without the Billions that the federal government has poured into the company. These Billions are NOT loans but grants!! Tesla received $465 millions(not billions) of LOAN. Not a grant or subsidy. And Tesla had to pay interest on the loan, up to 3.9%. Moreover Tesla Motors already paid $14.5 millions well ahead of the schedule(payment was done yesterday). Next payment should be done in December. And Tesla is expected to become cash flow positive next month. They have got more then enough private investments recently to to be not cash restricted. Tesla to Sue Mitt Romney. Tesla today retained a major silicon valley law firm to sue Mitt Romney for libel and slander. Watch the fireworks begin! Bluephrog - I have been paying attention, I've been covering Tesla for years. The government gave Tesla a $465 million (not billion) LOAN (not grant) and Tesla has made all the payments for that loan, and is prefunding the next payment. The company has also received oodles of private investment dollars, and has gone public as well. And it receives business income not just from selling the Tesla Model S, but selling battery packs to Daimler and drive train systems to Toyota. Yes the company is not out of the woods, is not yet profitable. That is true. And until its sales ramp up enough the company will be dependent on infusions of more capital from investors. The point is - it is an automobile startup that is nearly to the point where it can be rightly called a success. This is rare in the U.S., because it's been decades since the last successful automaker startup. It's a very expensive business to get into. For Tesla to get as far as it has, to get so close to profitability as it is, is phenomenal. Not disputing the fact that getting into automoblie manufacturing is very expensive. Your original thought (I think) was that Romney considers it a loser. It is a loser in the fact that WE are GIVING (not loaning) money to a company to keep it afloat. Yes, it appears it is a very well run company and hopefully it will be profitable, but it is still a money pit now. By the way, there are several companies WE invested in that were on the verge of being profitable that have gone under. At what point do you stop? When you are LOSING money, by definition, you are a loser. When you start being profitable you are a winner. Can you back up your claim that Tesla is being given, and not loaned, money? Everything we've seen thus far in news reports has shown that it is a loan, and that Tesla Motors is paying it back. Why do you believe that we are giving money to Tesla? See earlier comments please. Bluephrog ... how can you call a LOAN "giving money"? A loan where in fact Tesla is making both interest and principal payments while at the same time building a factory and developing a car from scratch and hiring 3,500 employees and building stores in the U.S., Canada and Europe. By your definition any start-up company is a loser. Is that how you want to see the world? Really? Tesla's current phase is simply that of a start-up company, and like all of them it requires investment to keep afloat until it gains enough sales to become profitable. In the case of Tesla (and Fisker for that matter) both are successfully raising private capital. Simply not true that only the 1% can afford a Tesla. I have neighbors on both sides of my street with Teslas, and they are hardly in the 1%! I think you should go to their site, and see the prices. One comment here says, incorrectly, that Teslas are only affordable by the 1%, which simply is not true. I suggest going to the Tesla site and checking the prices. I have neighbors in both directions from my house who have Teslas and they are hardly 1%ers! Another comment assumes the government is giving money to Tesla, while two others have explained that we are not, but rather that Tesla has been loaned money and pays interest. And obviously Tesla is not "failing." I suggest people fact-check everything Romney said in the debate. I totally agree with your point about Tesla. But you actually understated the success of Fisker. Despite their problems with DoE loan (which was NOT part of the same loan program that funded Solyndra by the way -- and which was originally approved prior Obama ever taking office), the Fisker Karma has received numerous awards -- including being named Luxury Car of the Year from Top Gear. Making it the ONLY American car to have ever received such an honor. Moreover, it was the #2 best-selling 4-door luxury car in the Netherlands. Fisker's issue with the DoE loan was totally blown out of proportion. In fact, much of the problem was caused by unrealistic goals set by the DoE -- especially for a start-up car company. They actually produced the Karma in RECORD TIME -- and were delayed in certification for months by the EPA, which apparently had (and still has) no idea how to gauge the Karma's real world mileage. (Many owners get over 100 MPG in daily use -- since they hardly ever use up their batteries.) Had the DoE resisted political pressure from the Right and had the EPA been more cooperative, Fisker would have had access the rest of the $300+ million in DoE loan money by now -- and would probably be creating thousands of jobs producing the Atlantic at their Delaware plant. Romney not only would have let GM go under -- but, if it were up to him, Tesla and Fisker would never have gotten off the ground. You should photograph the two Teslas in your neighbors driveway and send it to Torque News c/o Patrick Rall with permission for us to publish. You are almost certainly the only person on Earth that can report that situation. Unless you live between two Hollywood actors or employees of Tesla, that claim is absolutely unique. BTW, if your neighbor spent over $100K on a car, hate to break it to you, they are in the 1%. - Also, just for the record, GM did go under. Fisker is a European manufacturer of cars, not American. Fisker is HQ'd in America and the R&D staff is all in America. The choice of Valmet in Finland for manufacturing was because, according to Fisker, there were no contract automobile manufacturers in America that could handle the job. The Fisker Atlantic was due to be manufactured in Delaware until the frozen DOE loan scuttled that plan. I personally feel conflicted over covering Tesla and Fisker sometimes because both are targeting the 1% even though there might be cases where non-1%'ers are Tesla owners. At least in the case of Tesla they have a clear understandable plan/strategy/goal of moving downmarket and broadening their target market to include the 10%'ers. John, FYI: Fisker is based in Southern California. The were unable to find an experienced luxury car factory in the US that could assemble their vehicles, so they used a well-known Finish (Valmet) company that assembles cars for Porsche. But calling Fisker a European manufacturer of cars is like saying the Apple is a Chinese company. That post was at least marginally credible. There are numerous upper middle income types who drive Roadsters and the Model S Signatures that have been delivered so far. Think college professors or computer programmers who are true believers in EV's. It might not be a wise choice for your money, but a lot of people can afford the payments for a $100,000 car if they prioritize that. I am aware of groups of friends and family of modest means who were on the Signature list, and some of those people had the temporary leases on Roadsters that lasted until they received their Model S. The chance that a cluster of Tesla fanatics like that lives in the same neighborhood is higher than purely random chance. I know for certain that clusters like that exist on the scale of a town. Well... I have no faith in that website, that it is saying truthful things. The most recent posting there has a number of factual errors: e.g. "This was a ready-to-go car factory. There should have been no learning curve, no “build-a-new-car factory” delays ... " ... this is incorrect. At the time of the sale I looked into the specifics of the purchase agreement, and Toyota sold them a building and not the equipment inside the building. Toyota apparently held an auction to sell off the equipment. And in any case, Tesla's all-aluminum manufacturing would be unlikely to be compatible with Toyota's equipment. Also the factory was a JV between GM and Toyota. GM pulled out, leaving Toyota to hold the full cost of running the place, and leaving Toyota little choice but to close it down. So for example ... "So Musk got it and fired all of the car builders." This is incorrect. By the time Musk got the place, all the workers had already been laid off by Toyota. There was a worker re-education site across the street from the factory that processed the former NUMMI workers. Since reopening the plant Tesla has been working on rehiring and retraining the former NUMMI workers. "255 CARS!!!" 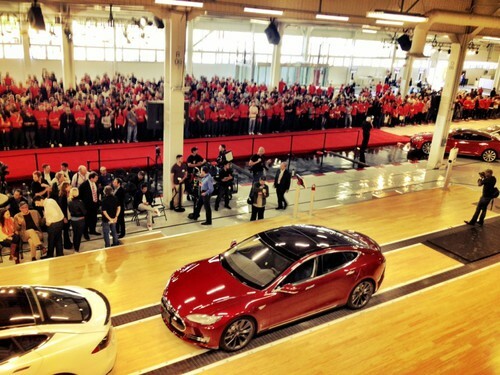 -- What Musk announced yesterday was 389 (or so) cars, and that they'd manufactured the 500th body. Also they keep posting pictures of roboticized assembly gizmos. "In a 500,000 car capacity ready-to-go, state-of-the-art car factory after spending hundreds and hundreds of millions of dollars for a factory that GM AND Toyota had already tuned up..." ... First .. to expect Tesla to go from 0 to 500,000 manufacturing base in one go is completely ridiculous. Especially for an expensive car targeted at the 1-2% crowd. Second .. It was not a ready-to-go factory because Toyota did not sell the equipment to Tesla, just the building. In other words - that blog appears to be focused on innuendo and not fact.